﻿﻿﻿﻿﻿﻿﻿﻿Texans ‘raise the barn’ together to protect native animals. ﻿﻿﻿﻿﻿﻿﻿﻿﻿﻿﻿﻿﻿﻿﻿﻿Back before construction companies, folks relied on family and neighbors to help build large structures by “raising the barn” together. The same hands-on partnerships are necessary for wildlife conservation today. Fortunately, Texas wildlife has many friends willing to roll up their sleeves to lend helping hands. One group in particular, the Texas Bighorn Society, epitomizes that barn-raising spirit. Three decades ago, this dedicated group of bighorn sheep enthusiasts began working toward the reintroduction of the desert bighorn sheep to its historic range in far West Texas. After garnering support from state leadership and the Texas Parks and Wildlife Commission, the TBS built “sweat equity” into bighorn conservation. They raised money to pay for conservation projects, starting 30 years ago with the construction of four 10-acre bighorn sheep brood pens at the Sierra Diablo Wildlife Management Area. Annually, the Texas Bighorn Society conducts work projects on public lands and private ranches in rugged bighorn country to enhance habitat for the sheep. Volunteers construct water supply devices and assist TPWD wildlife staff during bighorn sheep trapping and relocation projects. 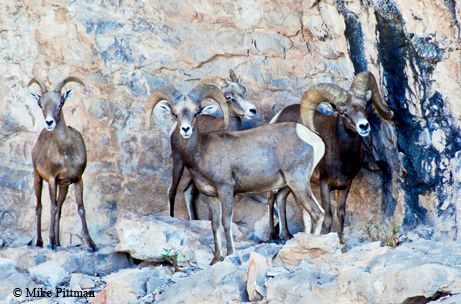 Thanks to their dedication to conservation, desert bighorn sheep now number nearly 1,500 animals across seven West Texas mountain ranges. You can see some of the group’s work and the bighorn sheep in action via webcam online at www.texasbighornsociety.org. ﻿Desert bighorn sheep have made a comeback in Texas, now occupying seven West Texas mountain ranges. Most wildlife conservation efforts in Texas occur behind the scenes on private property, understandable in a state where 95 percent of the land falls under private ownership. Groups like the Texas Wildlife Association, the Nature Conservancy of Texas, Texas Audubon Society, Ducks Unlimited, the National Wild Turkey Federation, the Texas Chapter of the Wildlife Society, the Texas Quail Coalition, Texas Master Naturalists and many others help make wildlife conservation happen in Texas. As their names imply, many of these organizations are focused on providing conservation for a targeted wildlife species. Other groups have broader or holistic interests. The commonality among these organizations is their dedication to conservation through grassroots collective efforts — barn-raising. These conservation entities don’t operate in a vacuum, but rather under an umbrella known as the Texas Conservation Action Plan. This plan, designed by wildlife authorities primarily for resources most at risk, aims to bring people together to realize conservation benefits, improve the status of species to prevent listings under the Endangered Species Act and preserve our natural heritage for future generations through efforts at the local or regional level. Conservation goals are outlined in 11 eco-regional handbooks. You can find information about the TCAP and how to get involved online at www.tpwd.state.tx.us/landwater/land/tcap. Neighboring landowners have also joined forces to “raise the barn” for wildlife in their areas, forming landowner associations focusing on collaborative efforts that benefit wildlife. These organized efforts share resources and knowledge to achieve wildlife conservation across property lines. In places like East Texas, where land fragmentation has created a patchwork of habitats, these cooperatives help piece the landscape back together for the benefit of wildlife. These associations tackle some of the bigger habitat management jobs, like prescribed fire projects, native grassland restoration and watershed protection. “Partnerships between agencies and conservation organizations and businesses, as well as cooperative efforts among landowners, are the wave of the future as we all try to accomplish more effective conservation with limited conservation funding,” says Linda Campbell, TPWD’s Private Lands Program director. With resources for wildlife conservation limited, skilled volunteers are also contributing to wildlife conservation through groups like the Texas Master Naturalists program. Communities and organizations across the state rely on Master Naturalists for implementing youth outreach programs; for operating parks, nature centers and natural areas; and for providing leadership in local natural resource conservation efforts. In addition, private landowners depend on the expertise of these volunteers to help them gain a broader scientific understanding of the ecology and management of their biological resources. It’s a shared vision that keeps wildlife conservation in Texas strong, much like raising a barn.